Two of the founders of YouTube who bought social bookmarking site Delicious less than a fortnight ago have announced that they have now acquired Tap11, a service that measures what is being said about a brand or business on Facebook and Twitter. AVOS is a new internet company set up Chad Hurley and Steve Chen, who started YouTube, selling it to Google in 2006 for $1.65 billion, and it appears its two acquisitions will complement one another as they see “strong synergy” between the two platforms. 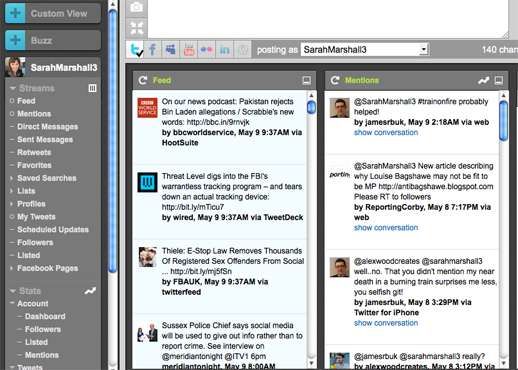 Tap11 has a similar layout to other third-party Twitter and Facebook clients, such as TweetDeck. When users post messages using the platform Tap11 analyses the reaction. You can monitor your brand, competing brands, plus individual campaigns and tweets and sort those reading your tweets by Klout score, a measure of online influence. It is currently free for a trial period but your are required to register and users will later have to pay a monthly subscription. According to AVOS, Tap11 currently works with more than 500 major brands, media companies, and agencies. Twitter selected Tap11 as a top six app at their Chirp conference. The platform is also a Webby Award winner. How is it useful to journalists? News websites could use Tap11 as a way of measuring what is being said about them on Twitter and Facebook, how many click-throughs, retweets and mentions each story gets and per-tweet analytics shown in easy to read graphs and charts. This entry was posted in Handy tools and technology, Online Journalism, Social media and blogging, Traffic and tagged avos, delicious network, Facebook, klout, Tap11, Twitter, YouTube on May 10, 2011 by Sarah Marshall.